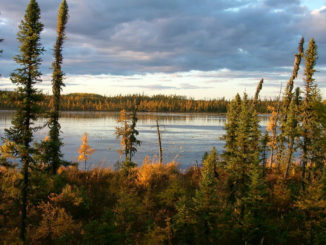 There have been moose strolling around downtown, black bears rifling through garbage bins in the suburbs, lynx spotted in residential yards, and cougars prowling through parks. The previous incidents have been few and far between, but are all part of living in Calgary. Two river valleys, numerous green spaces and natural areas, and the country’s largest urban park (Fish Creek Provincial Park) combined with the rapid growth the city has seen in recent years have all created the perfect recipe for in-town wildlife sightings and encounters. Thankfully large predators and ungulates are rare in our neighbourhoods, but there is one creature that is thriving in urban settings; the coyote. Canis latrans has lived in North America for more than one million years and doesn’t appear to be going anywhere soon. Coyotes sport a brown, grey, or reddish-grey fur coat with black markings on their back and tail. They have long ears, a slender, pointed muzzle, and a bushy tail that’s usually carried low and close to the hind legs. Adults can weigh between 10 and 25kg, placing them squarely in the middle between two of Alberta’s other wild dogs; the grey wolf and the red fox. They are highly adaptable creatures and quite resilient at thwarting man’s attempts at elimination, which have been plentiful. Whereas wolves will generally try and avoid any human contact, it is the coyote’s adaptability and resilience, combined with their high intelligence that allows them to flourish within the confines of many urban centres. 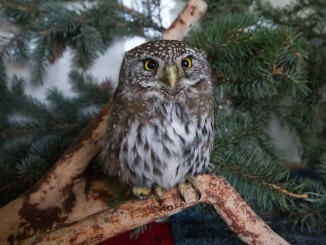 As Calgary encroaches on previously undeveloped wildlife habitat coyotes and other wild animals must relocate. Most will avoid the urban sprawl and attempt to stake out new territory away from the city, however upon discovering easily accessible sources of food, coyotes did the opposite and began to carve out a living within the city limits. A mother coyote and her litter of pups captured on a remote wildlife camera. It should be noted that coyotes don’t choose to move into the city, but instead hold onto the green spaces we leave undeveloped. Some of the coyotes we see in Calgary are transient, meaning they’ll move in and out of the city at different times of the year, while others are resident coyotes and reside in the city year round. It’s important to understand that coyotes remain in the city because they are able to access everything they need to survive; food, water, shelter, and mates. 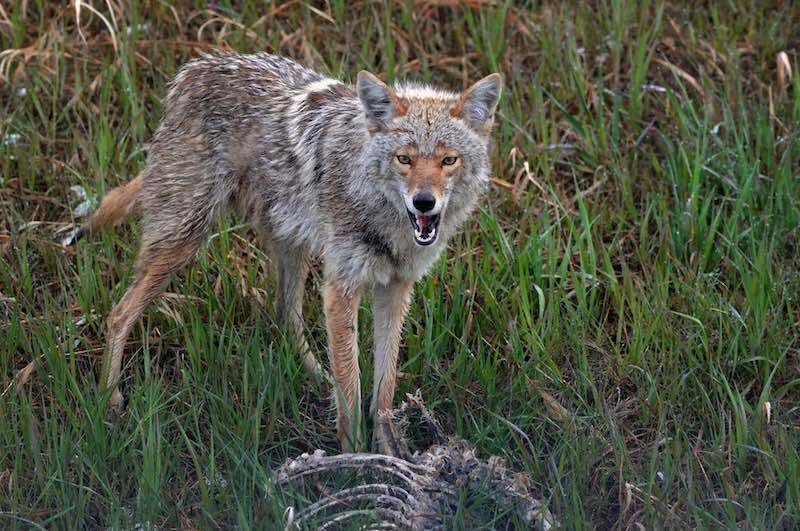 Coyote food is usually comprised of small rodents, such as hare or mice, but they will also scavenge roadkill and other carrion to supplement their diet. Coyotes are largely opportunistic, meaning they’ll acquire meals in a variety of ways. Garbage that is improperly stored, bird seed, dog food, or seasonal fruit that has fallen from trees are all easily accessible and can lead to unwanted encounters. Remember if you are continually seeing coyotes in your neighbourhood it is because they’ve found a reliable food source or suitable habitat. Eliminating non-natural food sources will encourage coyotes to move on. 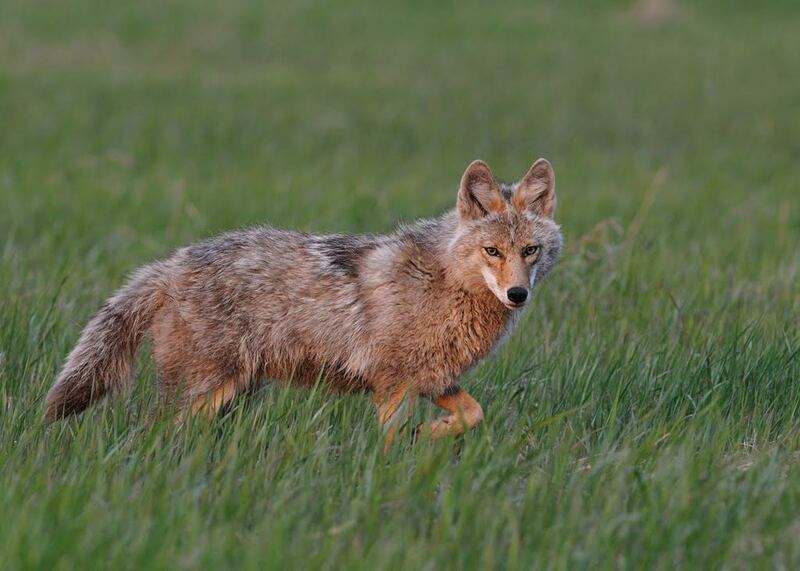 During a one year study (2006/2007), 484 coyote scats were collected throughout Calgary. Of those scats small rodents were the most common food item found, occurring in 84.7% of the scats collected. Herbaceous plants (44.6%), Crabapples (33.9%), and berries (16.9%) accounted for the other natural sources of food. Anthropogenic food sources, mainly garbage, was found in 14.1% of scats collected, while domestic animals (i.e. 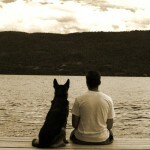 cats and dogs) were only found in 6 scats (1.2%). 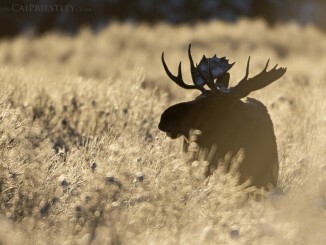 Calgary is an outdoor-friendly city that encourages recreation in its numerous parks. With more and more people accessing the city’s green spaces, encounters with coyotes are inevitable, but thankfully violent attacks are extremely rare. Back in 2005 two toddlers were attacked by a coyote on the same day (one in Confederation Park and one in the community of Rosedale). It was later determined that the coyote responsible for the attacks was food-conditioned and had lost its natural fear of humans. Those two encounters represent the majority of violent attacks by coyotes on humans in Calgary. Both of the children were fine in the end and the coyote was destroyed. Non-violent encounters occur more frequently, but are still not commonplace. There are things you can do to mitigate encounters, such as supervising young children, keeping your pets on a leash, and making your presence known while in wilderness areas. If you do see a coyote make the encounter uncomfortable for the animal by yelling, making yourself appear larger, maintaining eye contact, waving your arms, and even throwing rocks or sticks towards it. Running away may engage the coyote’s natural chase instinct, so avoid this tactic even though you may feel compelled to do so. 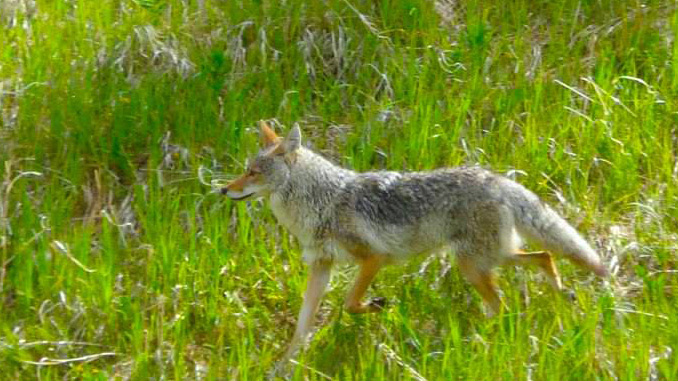 It can be beneficial to report any coyote sightings or encounters to the city by calling 3-1-1. You can also report sightings or injured coyotes to the Calgary district office of Alberta Fish and Wildlife (403-297-6423). 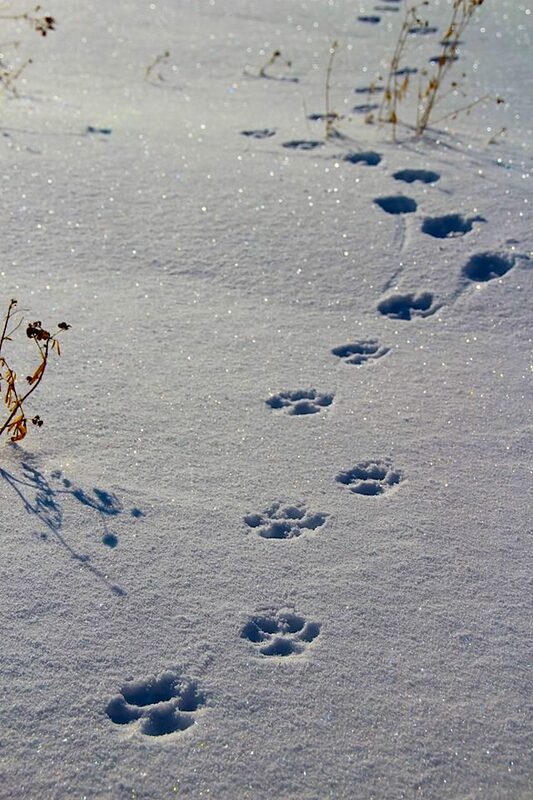 Of the 1,684 human-coyote encounters between January 2005 and April 2008, 89% were classified as Level 1; sightings that didn’t result in conflict. Just 2% fell into the highest classification, Level 5, where there was evidence of an attack on a person or a pet. Coyotes are not bloodthirsty creatures hellbent on attacking small children or killing your pets, but unfortunately these events do happen on occasion. 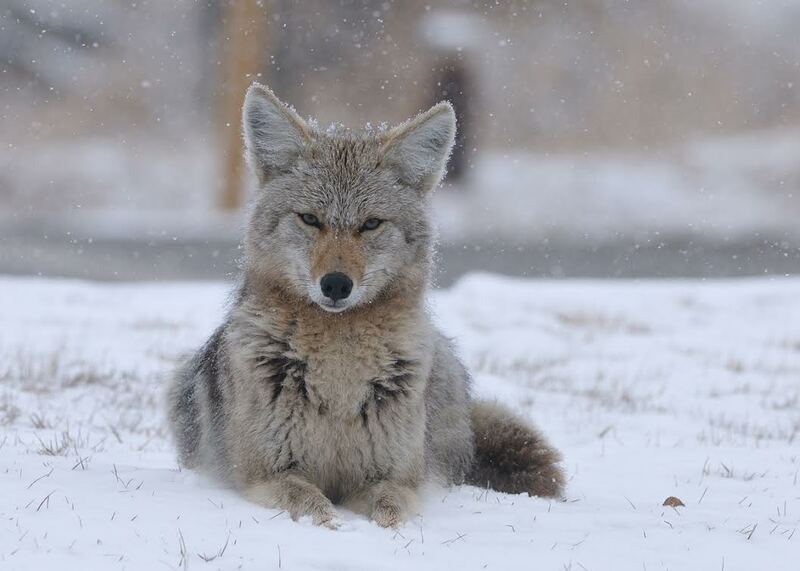 Some have called for the rapid elimination and extermination of the coyote from all of Calgary. Unfortunately this has proven to be an ineffective strategy as it only creates a void waiting to be filled by more of their wild brethren. Instead a more effective approach has been through education and aversive conditioning; a non-lethal method of control aimed at changing the animal’s behaviour by making all human-coyote encounters unpleasant for the animal. Accepting the wildness of Calgary and embracing the fact we share this beautiful city with our untamed neighbours are just two more reasons that make this city an amazing place to live! I would like to take this opportunity to thank Dr. Shelley Alexander for her assistance with this story. Her knowledge and expertise in the field greatly contributed to the accuracy of the information contained in this story. 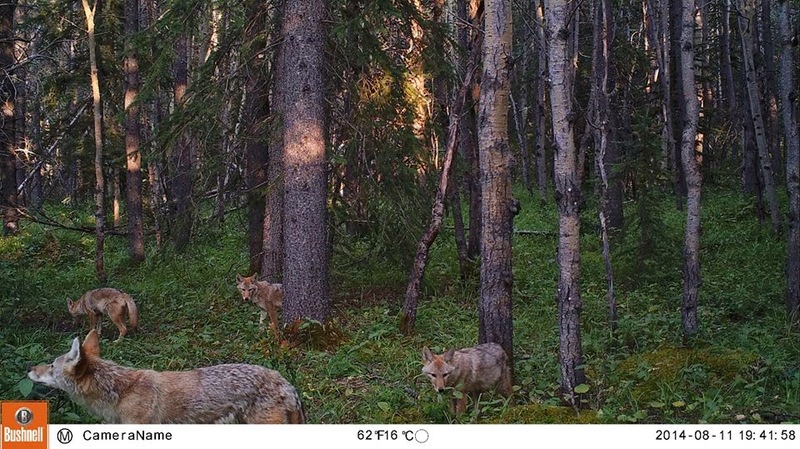 Dr. Alexander leads the Canid Conservation Science Lab at the University of Calgary and is currently conducting research through the Foothills Coyote Initiative, which is an extension of the Calgary Coyote Project (2005 to 2013). Her project aims to gather data from local landowners through interviews in order to document and better understand interactions with coyotes, identify the key issues faced by landowners, and learn what strategies are used to reduce conflict. Dr. Alexander is currently looking for rural, residential, and/or agricultural property owners that are willing to contribute to her study. The broad study area extends from the City of Calgary, west to the Rocky Mountains, north to Water Valley, and south to Bragg Creek. If you live within that area and are willing to contribute please get in contact with Dr. Alexander via the Foothills Coyote Initiative website. For additional information regarding urban coyotes please visit the City of Calgary website or the Alberta Environment and Parks website. You can also download the Urban Coyotes educational brochure from that website that contains lots of useful information. To view more of Peter Vaudry’s incredible wildlife photos please visit his Your Shot webpage, which is part of the larger National Geographic network. American novelist and poet Hamlin Garland once wrote, “whenever the pressure of our complex city life thins my blood and numbs my brain, I seek relief in the trail; and when I hear the coyote wailing to the yellow dawn, my cares fall from me – I am happy.” Except in our case we won’t have to leave the city behind in order to hear the spine tingling, eerie song of the coyote as he goes about his daily routine amongst the commotion of a bustling city.